Landing craft project 21820 code "dugong" (NATO — Dyugon) — a series of recent Russian landing craft air cavity, the lead ship of the series is the boat — D-105, "Ataman Platov." At the current time, he is the only one built on the project and the ship comes in the Caspian Flotilla. Now the building is still two boats of this project — one built by JSC "East Wharf" in Vladivostok, the second on "Shipbuilding Plant" Volga "in Nizhny Novgorod. Also in 2011, a contract was signed for the construction of a series of 3 landing craft project at 21820 OAO "Yaroslavl shipyard." 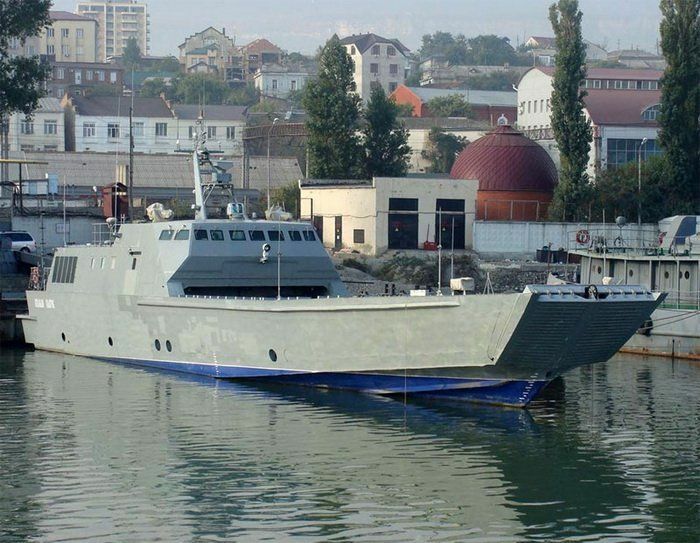 1st of 3 ships of this series has been laid to YASSZ January 18, 2012, ship given the name "Denis Davydov." The head of the launch of the project was laid in 2006 and 2010 comes in the 1st of the compounds of the Caspian Flotilla and was given the name "Ataman Platov" in honor of the commander of the stateliness of the Don, whose shelves in 1814 were in Paris and "gave" the French the capital of a new kind of catering establishments — the bistro (from the Russian word for "quick"), because the Cossacks in Parisian cafes are clamoring to be served as soon as possible. It should be noted that landing craft inherent in Yaroslavl, will be named Hero of the Russian war of 1812, that year its 200th anniversary is really burning. Three boats being built in Yaroslavl, will be named "Denis Davydov," "Lieutenant Rimsky-Korsakov" and "Midshipman Lermontov." The latter two were members of the Marine Guards and took part in the campaign of 1812. Landing craft project 21820 "Dugong" was developed in Nizhny Novgorod spices "Central Design Bureau for Hydrofoil" them. RE Alekseev. This design bureau practiced in the research, design and development of high-speed ships, vessels and boats dynamically supported. Designers and scientists of the KB have been made which have no analogues in the world WIG ships or as they are called — "Caspian Sea Monster". This missile "Lun" and transportlanding "Eaglet", which were capable of speeds during the main mode of movement of up to 500 km / h For projects done in the "Central Design Bureau for Hydrofoil" them. 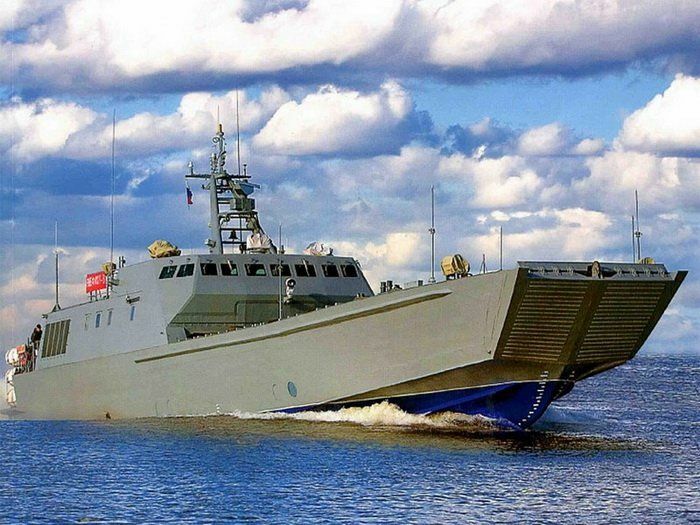 RE Alekseev produced more than 8000 ships with hydrofoils as a civilian and military mission. At the current time, the rate at the time of landing operations plays a huge role. Faster than the equipment and troops will be delivered to the staging area, the more likely it is that success in this area will develop. 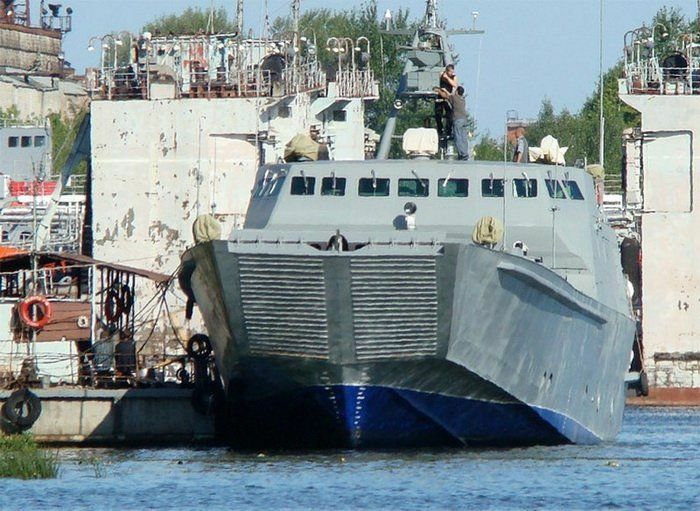 Experience that received Russian sailors during the use of landing craft, "Serna" project 11770, again confirmed this result. But it became a natural and something else: as individual combat units now require even more speed vessels holding more Troops capacity and carrying capacity. With all of this amphibious and mobile properties of the new ships had to meet the same design features of the boats 11770. These incidents were the impetus for the creation of a new transport and landing craft air cavity, which became boat project 21820 "Dugong". Total displacement landing craft air-cavity of the "dugong" is 280 tonnes, is a large — 45 meters long and large — 8.5 meters., Draft — 1.9 meters. The highest speed — 35 knots with wave height 0.75 meters. Ship can be used in the criteria for the storm wave height less than 3.5 meters. Landing craft project 21820 equipped with 2 types of diesel engines M507A-2D with a capacity of 9000 hp each. Most cruising range of 500 nautical miles. Dimensions of the cargo hold — 27h6, 8×2, 34 meters, the maximum load capacity — 140 tons; landing boat can carry up to 3 or 5 MBT BTR. In the control landing craft "dugong", together with marine information-computing system MIBK 6P-08B, girokursoukazatelem MAS-5, lag LI2 1 and engines, that are equipped with tachometers type TE-204 is used and the autopilot "Agat-M3" (development and the creation of "SPE" ANFAS "Saratov). With all of this might be the introduction of the upgraded autopilot "update 4". Propulsion and steering system landing craft, comprising own composition ventilated water jet, within the dimensions of the hull and allows to work perfectly in the criteria weedy waters and shallow waters. Landing craft crew of 6 people. On the landing craft is armed. In the standard configuration it consists of 2 mnogokalibernyh MTPU caliber machine gun 14.5 mm, and 8 types of MANPADS "Igla". At the request of the customer structure and assembly of weapons can be changed. 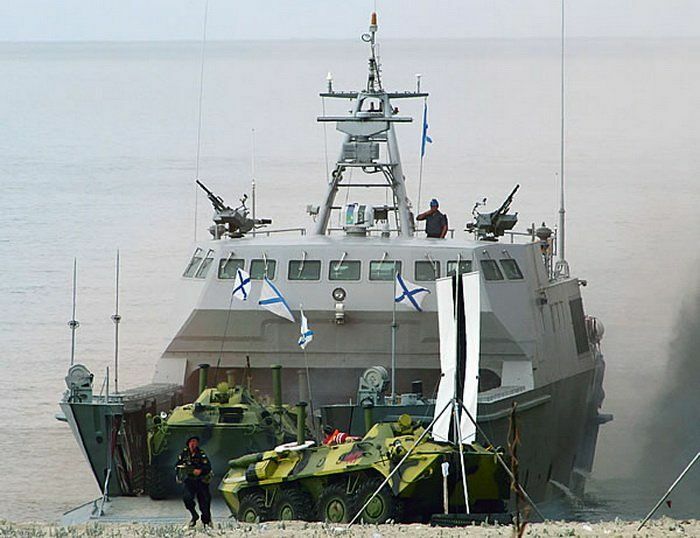 Its pretty damn highest military ships of the project, namely the one who is in the line boat landing "Ataman Platov", confirmed as part of the strategic maneuvers "Center-2011", which took place including in the Caspian Sea. As part of the exercise boat landing quite rapidly delivered to the battlefield and dropped on unequipped coast armored vehicles and Marines. It is reported that these vessels can be used together with a helicopter landing ships docks of the "Mistral", which are now being built for the Russian Navy. Tank-landing craft projects 11770 "Chamois" and 21820 "Dugong" one hundred percent fit for the "Mistral" for its weight and size traits. These boats, along with a group of aviation "Mistral" are made for delivery of arms and forces landing ship dock on the saved. At the current time, the construction of ships of project 21820 for Russian Navy continues. A CDB SEC them. RE Alekseev continues to work to improve the boats of the project and the creation of new modifications. They all differ from each other mainly power plants, assembly solutions, propulsion, speed and displacement. But for all that everything could not be better suited for implementation in amphibious operations in the waters enclosed and semi-enclosed seas, bays and archipelagic waters.